'BHAJAN' or 'NAAMSAMARNA' means group devotional singing of the glory of god. When and wherever his glory is sung, he is always there. Unless you sing bhajans for your own ecstacy, you cannot bring joy to others, thus preventing them from sharing 'ANANDA' i.e. bliss. 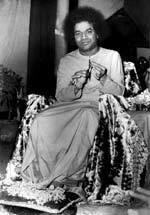 With each bhajan sung the mind must be rendered purer, free from passion and stronger in faith. In this 'KaliYuga' the remembrance of the lord's name is enough to win his grace and attain liberation from the cycle of life and death. Everybody should be seated a few minutes prior to start of the bhajan. Men should sit on one side of the prayer hall and women on the other. Bhajan leader and instrumentalists must be seated in the front few rows. Devotees arriving late must not disturb those already seated. They must quietly seat themselves behind the already seated devotees. Do not look around greeting one another, nor talk during the bhajan. Maintain perfect silence and restrict your movements to a minimum while sitting in the prayer hall. 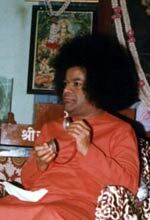 Sing sweet, familiar and devotional bhajans in any language which can be understood and sung by other devotees. Musical instruments used during bhajans should not drown the voices of the singers and those who follow, thus maintaining a balance between the instruments and singing. Do not clap out of tune. Do not monopolies the time in bhajans by singing one bhajan for six or ten minutes repeating the same lines again and again. Bhajans should be sung in two speeds: slow and fast. In the slow speed, sing each line twice and, in the fast speed only once except the last line which should be sung twice to signal the conclusion of the bhajan. If your voice is not sweet or pleasant, it is best to remain silent; that is the best service you can do. Keep devotional songs as simple as you can, without competitive pomp or show. When you sing devotional songs, dwell on the meaning of the songs, and the message of each name and form of God, and roll on your tongue its sweetness. Let those with a good voice and musical talent lead; the devotional singing must be pleasant and it should not jar on the ear. If your voice is grating or out of tune, repeat the words in your mind. Bhajans are best held on Thursday evenings and Sunday evenings - but that is no unbreakable rule, for it is not the day that counts. It is the heart that must be ready and eager to sing the joy and share it. Share aloud the glory of God and charge the atmosphere with divine adoration. Think of it as a part of spiritual training to be taken seriously for reducing the attachments to fleeting objects, for purifying, and for liberating you from the circle of birth, death, and consequent misery.